Right now, your options when you go to the grocery store are paper or plastic; but that could soon change. 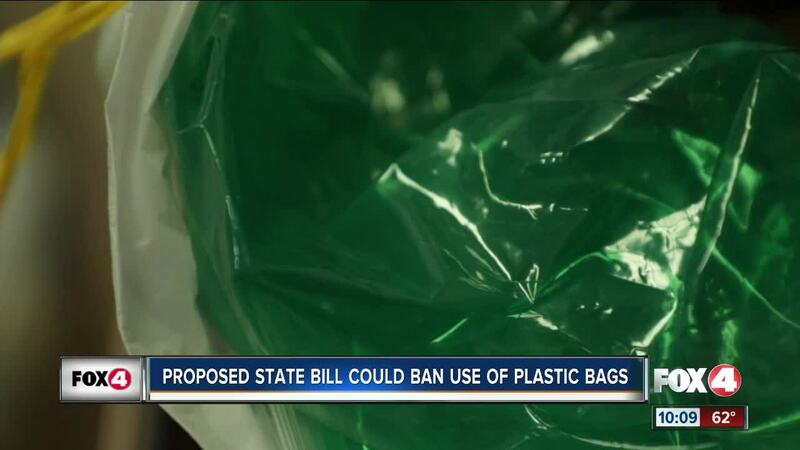 A proposed state bill would ban the use of plastic bags. CAPE CORAL, Fla. -- Right now, your options when you go to the grocery store are paper or plastic; but that could soon change. A proposed state bill would ban the use of plastic bags. Ruth McGregor always uses reusable bags, some call her “the bag lady”. She keeps them in her car because she wants to keep plastic bags out of the environment. “I want to make sure we keep it clean and free of any plastic debris,” McGregor said. Much of the plastic debris goes into the oceans. A story by National Geographic found there is an estimated 5.3 and 14 million tons of plastic ending up in the ocean each year just from coastal regions. “Especially in coastal regions, where we have so much runoff that runs into our rivers and into our oceans,” McGregor said. Marine life eats plastic in the ocean because they mistake it for food. “They’ll just end up getting full on plastics and plastic bags and then they’ll ultimately end up starving to death,” McGregor said. Even people can end up consuming small particles of plastic. The particles don’t completely break down, so they can end up in waterways. McGregor, who is the group chair for the Sierra Club Calusa Group, measures the levels in local waters. “Our waters are testing extremely high with micro plastics and micro fibers,” McGregor said. Senator Kevin Rader is looking to change that. He filed Florida Senate Bill 502 earlier today, which proposes to prohibit all stores and food service businesses from selling or supplying plastic bags and straws. Coral Gables, a city near Miami Beach, approved a citywide ban on plastic bags in 2017 and St. Petersburg is also working on a plan to prohibit them. Fort Myers Beach and Sanibel already have a citywide ban on plastic straws. Some local thrift stores encourage their customers to reuse plastic bags instead of throwing them out. “Each customer brings in 5, 6, 7, 10 bags and then we recycle and send them back out again,” said David Rigby, Pastor at the Cape Coral Community Church and owner of Cape Coral Community Thrift Store. One environmental agency says a plastic bag has to be used 100 times in order to have a positive effect on the environment. Rigby says he likes the idea of a statewide ban. “We would help in anyway we could to stop that waste,” Rigby said. McGregor suggests using old t-shirts to make a reusable bag, or order bags made from old water bottles. A petition is also circling to ban Publix from giving out free plastic bags.